Blog Comment SPAM is annoying is an understatement. Working with many clients that run WordPress, I hear their complaints about the massive amounts of comment SPAM they are getting on their blogs. Thinking about this I came up with only one solution… every single comment spam that I see has only one thing that is in common – links. Every one of the spammers do this for the links, so why not take that away from them? 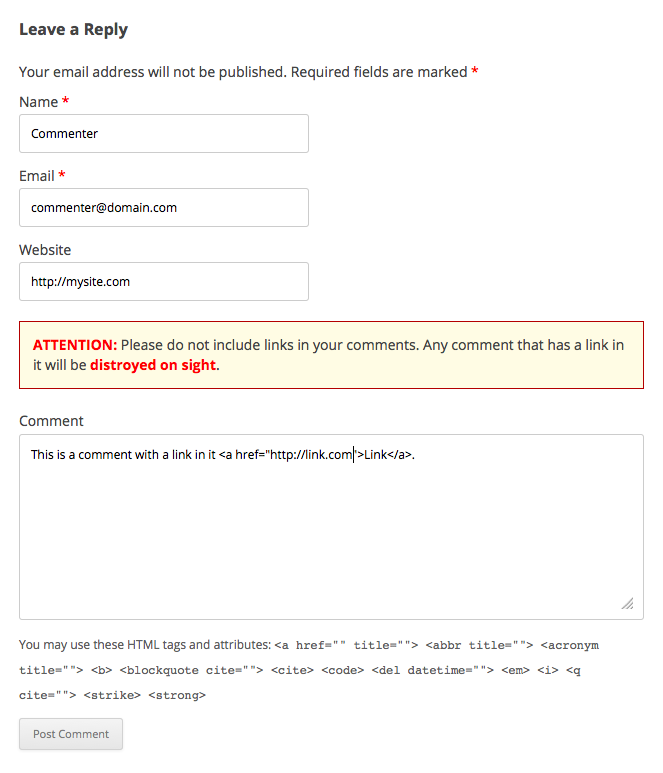 This is a simple plugin for WordPress that detects a link in the body of the comment and warns the commenter that their comment will be destroyed on sight. At this point a real legitimate commenter can make a decision to not include a link in their comment. An automatic spam bot will not care about that message and will just submit the message anyway. This is when the destruction begins, the plugin filters the message and obliterates it if it detects a link. The admin area of this plugin allows you to change the warning message and to choose wether you want the SPAM messages to be sent to trash or completely deleted. No, this plugin does not do anything to the already existing comments.. only new ones that come in. Very simple but so useful! Also please rate the plugin on WordPress plugin directory to help spread the word here. Thank you!! Guys, please submit your feedback here. I’d love to hear if this is useful to you. Thanks a million! Thanks Valik, I appreciate it a lot.